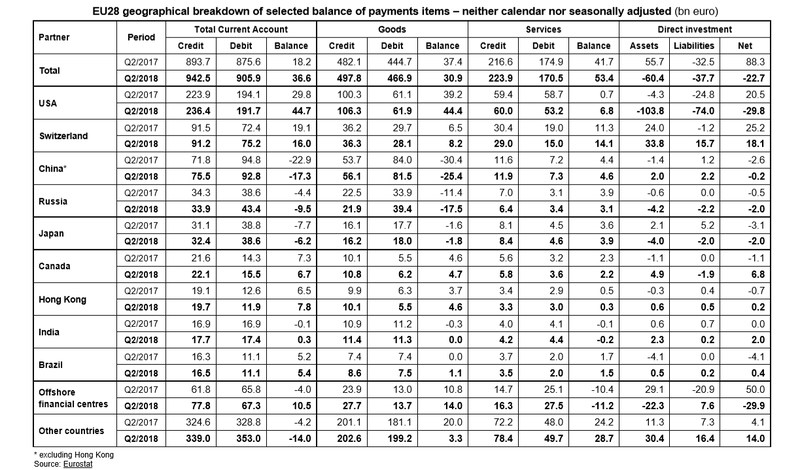 The EU28 seasonally adjusted current account of the balance of payments recorded a surplus of €62.0 billion (1.6% of GDP) in the second quarter of 2018, down from a surplus of €68.2 billion (1.7% of GDP) in the first quarter of 2018 and up from a surplus of €41.3 billion (1.1% of GDP) in the second quarter of 2017, according to estimates released by Eurostat, the statistical office of the European Union. In the second quarter of 2018 compared with the first quarter of 2018, based on seasonally adjusted data, the surplus of the goods account decreased (+€24.6 bn compared to +€37.7 bn). The surplus of the services account grew (+€54.0 bn compared to +€50.6 bn), as did the surplus in the primary income account (+€5.1 bn compared to +€0.8 bn). The deficit of the secondary income account increased (-€21.8 bn compared to -€20.9 bn), as did the deficit of the capital account (-€3.5 bn compared to -€1.6 bn). 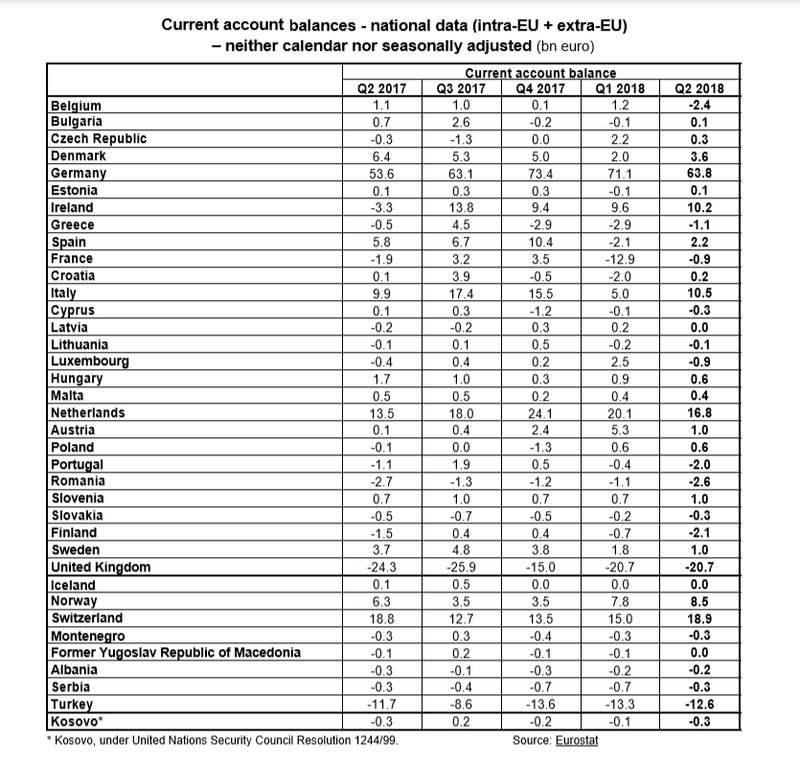 In the second quarter of 2018, based on non-seasonally adjusted data, the EU28 recorded external current account surpluses with the USA (+€44.7 bn), Switzerland (+€16.0 bn), offshore financial centres (+€10.5 bn), Hong Kong (+€7.8 bn), Canada (+€6.7 bn), Brazil (+€5.4 bn) and India (+€0.3 bn). Deficits were registered with China (-€17.3 bn), Russia (-€9.5 bn) and Japan (-€6.2 bn). The euro area (EA19) currently includes Belgium, Germany, Estonia, Ireland, Greece, Spain, France, Italy, Cyprus, Latvia, Lithuania, Luxembourg, Malta, the Netherlands, Austria, Portugal, Slovenia, Slovakia and Finland. Offshore Financial Centres (OFC) is an aggregate which includes 40 countries. As examples, the aggregate contains financial centres such as Liechtenstein, Guernsey, Jersey, the Isle of Man, Andorra, Gibraltar, Panama, Bermuda, the Bahamas, the Cayman Islands, British Virgin Islands, Bahrain, Hong Kong, Singapore and the Philippines.